OLYMPIA – Many people who have a physical or intellectual disability are often overlooked in sports, according to Dino Mayo, a community corrections supervisor for the Department of Corrections' Lacey field office. "We need to see people as handi-capable, not handicapped," Mayo said. "These are citizens that are productive, eager, and normal, but society doesn't always see them that way. They may not feel included." That's why Mayo is serving as the Department's agency coordinator for the annual Special Olympics Law Enforcement Torch Run® (LETR) for Thurston County. Special Olympics was started by Eunice Kennedy Shriver in 1968 as a way to provide people with intellectual disabilities a place to play and feel included, according to organization officials. LETR engages law enforcement worldwide in championing acceptance and inclusion for people with intellectual disabilities, starting first with their own communities. It is the largest public awareness vehicle and grass-roots fundraiser for Special Olympics. The Department of Corrections is one of several local law enforcement and emergency response agencies in Thurston County who will have employees participating in the run. One of the agency's core values is to engage in positive community interactions. The event starts at 8 a.m. Friday, June 2. The route starts at the Tumwater Safeway at 500 Cleveland Ave. and goes on to Capitol Blvd. where participants will participate in a ceremony. From there, the route advances to the Olympia Police Department, and continues along Martin Way to Sleater-Kinney Road, then to Marvin Road and eventually out to a spot in the Nisqually Valley. Law enforcement torch carriers, known as Guardians of the Flame®, will be passing the Flame of Hope all along the route. The Flame of Hope symbolizes courage and celebration of diversity uniting communities according to Special Olympics Washington. 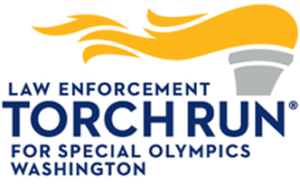 Participants in the Pierce County leg of the run will meet Thurston County participants in the Nisqually Valley to bring the torch to Joint Base Lewis McChord to kick off the Special Olympics Washington State Spring Games later that evening. There is no designated person who holds the torch during the run, as the goal is to pass it to as many people as possible. The torch travels across all 39 counties in the state. In all, approximately 2,000 law enforcement personnel are involved in the run and raise over half a million dollars annually for local programs, according to the Special Olympics Washington website. Mayo has participated in the run for the past 12 years. He's no stranger to people with disabilities. He has a brother with cerebral palsy and a wife who now has to use a wheelchair after suffering a stroke. He says the run is a good way to honor his family members and all people with disabilities, as well as to foster relationships between law enforcement officers and the community. "It's all about the camaraderie, the uniting into action of agencies to do something good for the community."